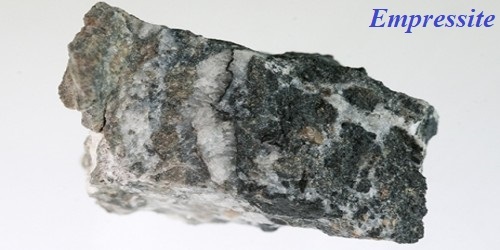 Empressite is a mineral form of silver telluride, AgTe. It is a rare, grey, orthorhombic mineral with which can form compact masses, rarely as bipyrimidal crystals. It is a rare hexagonal mineral form of silver telluride. 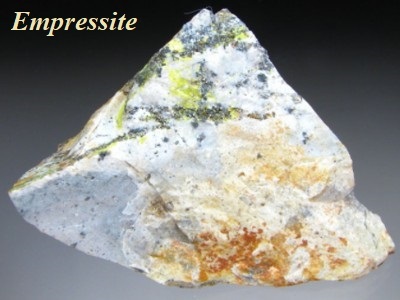 The name empressite comes from the location of its discovery – the Empress Josephine mine, Saguache County, Colorado, US. It was first described in 1914. Recent crystallographic analysis has confirmed that empressite is a distinct mineral with orthorhombic crystal structure, different from the hexagonal Ag5−xTe3 with which empressite has been commonly confused in mineralogy literature. At the same time, empressite does not appear on the equilibrium Ag-Te phase diagram, and therefore it is only metastable at ambient conditions. Given infinite time, it would phase separate into pure Ag5Te3 and pure Te.